I recently went to a conference where we were served the most delicious lunch. I’m always a bit dubious about lunches at these types of affairs, being wheat free means I get served all kinds of random thing. I now always travel with emergency oat cakes in my bag! Anyway, this conference had amazing, nutritious, delicious food. The chicken and quinoa salad totally inspired me to get my quinoa out of the back of the cupboard and use it. I’m totally happy with the result, this is one delicious dinner and it would also make a perfect packed lunch. Plus all my family enjoyed this. Major brownie points were earnt. YAY. A nutritious, delicious quinoa salad, packed with antioxidants and supercharged with vegetables. It will tantalise your tastebuds and leave you feeling like you have eaten health on a plate! Prepare the vegetables by peeling the carrots and then chopping carrots, courgettes and pepper into small chunks. Place into a baking tray and drizzle with olive oil. Place into the oven for 30 minutes, shaking or turning hafway through. Meanwhilst, cook the quinoa, place 1 cup of quinoa in a saucepan and cover with 2 cups of water. Bring to the boil and simmer for 10 minutes with the lid on. Switch off and leave the lid on so it steams for another 10 minutes. Chop the greens and shred the cooked chicken into bitesized pieces. Now mix everything together. 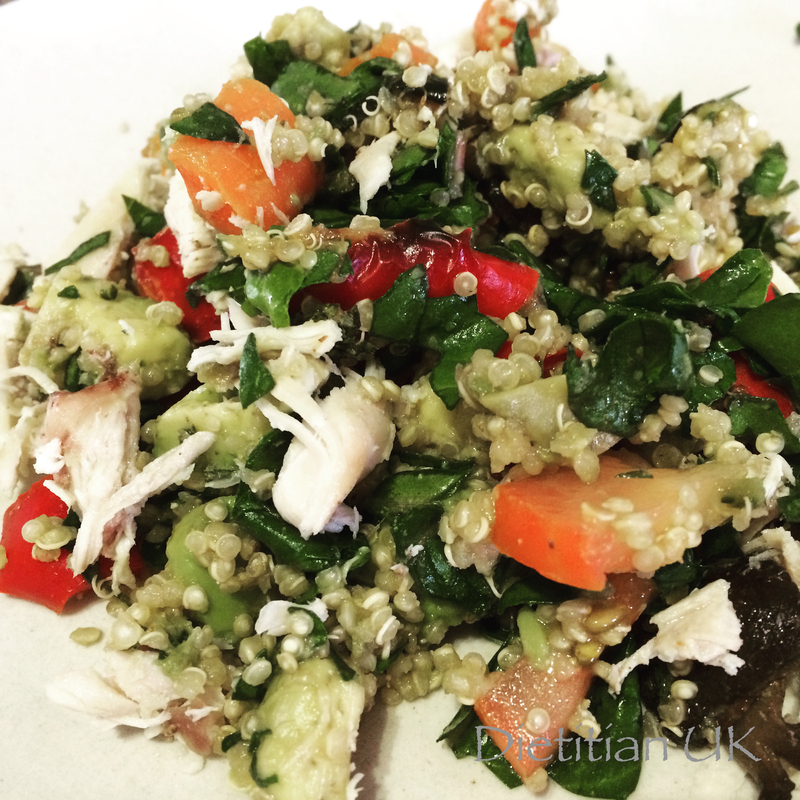 Add the vegetables and chicken to the quinoa, along with the greens and avocado, Stir well to combine. Dress with the lemon juice and herbs and place the lid back on the saucepan. Leave it for 10 minutes to infuse and then serve either warm or cold.